What the F*&@ Happened to All These Airlines? I haven’t done an Ask Cranky post in awhile, and this one seemed like fun. 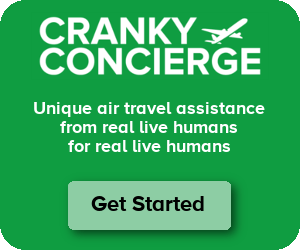 I was looking through the archive of “Who the F” articles you’ve written through the years, and I think it would be cool to see a follow up on each of the 19 airlines you’ve covered. Some have taken off and become extremely successful like Allegiant, and some are PeoplExpress. I’d love to read a where-are-they-now? Thanks! By now, I’m pretty sure I don’t need to tell you who they are, because everyone knows Allegiant (whether for good or bad reasons). SkyValue wasn’t an airline but rather a virtual carrier that sold flights operated by Xtra. This used the long-promoted idea that Gary could be a good reliever airport for Chicago. It didn’t work. SkyValue lasted for all of one winter season, ending flights on May 6, 2007 for good. Like SkyValue, Western was also a virtual carrier using airplanes flown by Xtra. And like SkyValue, it didn’t last long. The attempted resurrection of the once-storied name in air travel did not go well. Flights started from Bellingham in January and made it just about a month before failing. Western was a bit ahead of its time. Allegiant soon figured out that it could make good money flying Canadians from Bellingham to other points in the US, but Western wasn’t able to capitalize. I had completely forgot about these guys. They started off flying a small regional route, but then they had big plans to fly to small Midwestern cities from Newark and Baltimore. Does that sound like a good plan to you? It wasn’t. The idea morphed a couple of times and eventually became Jet America from its Toledo base, launching service in May. The airline screwed travelers early on and stumbled until it shut down in July. I’m not even sure why I wrote about this one. Viza wanted to start flights from Gary, just like SkyValue. The thing is, it was just an idea and it never went anywhere. It was so insignificant, I didn’t even have an image for it. I knew this one wouldn’t get started, but its absurd proposition is precisely why I wrote it up. The idea was apparently to fly an all-business class configuration from Seattle to Anchorage. Why? Who the heck knows. It never happened. Here’s another one that you might have heard of but not for good reasons. California Pacific never flew back in 2010 when it proposed Carlsbad, CA service, and in fact, it disappeared quietly after failing to gain its certificate. But the airline rose from the ashes, acquired ADI, and started flying a few months ago. After being plagued by pilot shortages and maintenance issues, the airline stopped flying. It says the flights will return. I’ll believe it when I see it. This one brings back some memories. Vision started out flying little planes out of Vegas, mostly taking tourists to places like the Grand Canyon. At some point, it acquired 737s and did charter work that included government flying. But then, someone got the big idea to start flying scheduled flights out of Destin in Florida. I did not have high hopes for this and recall getting some pretty nasty emails from people tied to the company. It moved into Myrtle Beach at one point to try to salvage the airline, but that didn’t work. Vision provided aircraft under the People Express name, but then it found itself mired in legal battles including charges of grand theft. The whole thing collapsed under its own weight, and Vision mercifully disappeared. If you blinked, you might have missed the brief resurrection of People Express from the dead. This one was based at Newport News, VA, and as you can tell from this post, I knew it was destined to fail. It made for an awkward conversation with the airport manager of Newport News when I ran into him at a conference, that’s for sure. This did fail spectacularly, and People Express left Newport News holding the bag with a bunch of unpaid bills. This was another one of those hilarious ideas that clearly would never take flight. The idea was floated when Republic still owned Frontier and was looking to sell. This would have moved Frontier to New Orleans and started service. Needless to say, the airline was sold to Indigo instead and this whole idea turned to dust. This is the only other successful airline I covered in this series. Lion Air has always been a secretive Indonesian airline with fast growth plans. If you didn’t know it before, you probably heard about it when Lion lost a 737 MAX shortly after takeoff. Lion Air continues to grow despite past safety issues, and it now has more than 100 aircraft flying. Texas and California have long supported frequent, regular intra-state service. Despite having a lot of people and population centers, Florida has never been able to make that type of service work. Florida Express Jet was going to use aircraft operated by Swift to connect parts of the state, and it even started selling tickets. In the end, it never actually flew. The final nail in the coffin was when the funding failed to come through. I covered OneJet a few times here on the blog. I was fascinated by its niche small jet effort to fly between cities that had lost nonstop service. The airline had a lot of big names backing it, and it did fly. But it pivoted from Indy to Pittsburgh and then failed. Now there’s a giant legal mess that has left all kinds of people in a bad place. I suppose this one could be considered a success. The subscription-based service started up in Texas, and it kept flying until it was acquired by Surf Air out of California. Surf Air has had its own troubles, but RISE as a name is long gone. Remember these guys? They were flying seaplanes between Boston and New York and were going to grow it into a shuttle-style service. They also had flights to weekend getaway spots like Nantucket. I don’t remember hearing much about them after this, but best I can tell they’ve canceled any scheduled operations and have just gone back to flying charters. Probably a good plan. We all know what happened here. Primera decided last year to start long-haul, low-cost flights across the Atlantic. It over-extended itself, had to cancel a bunch of flights, and then never made it through the winter. The airline is gone. My most recent write-up has no ending as of yet. Best I can tell, AURA is still trying to fly. I haven’t seen any updates from the company except for an announcement that it had arranged for a discount on luggage for the people who signed up for early membership. So there’s that. I still doubt we’ll ever see it fly, but nobody has given up yet. This was quite the trip down memory lane. It also reminds me that I need to do more in this series. So, keep an eye out for that in the future. 18 Responses to What the F*&@ Happened to All These Airlines? All of your emails look like this. Too bad! Thanks for doing this article, Cranky! Some of these I’ve never heard of. I do like tail end of the Florida Express Jet though. You make it sound that Allegiant’s discovery of the opportunity came after Western started flying to Bellingham. Allegiant started flying Bellingham to Vegas in 2004. By the time Western started in Bellingham, Allegiant had been flying Canadians to Vegas for years. Enplaned – Whoops, guess my timing was off. The California Pacific story was kinda like a “Make-A-Wish” foundation fairy tail story that Hallmark could have turned into a movie. I was really rooting for the old guy. A last, big hurrah before his big appointment in the green room. I wish it had worked out like the handsome prince kissing beautiful sleeping beauty awake and into everlasting love. Waaa. Fun piece. I will really miss OneJet. Thanks, Cranky. When neo-Western announced, I was hopeful. Dad worked for Western from the mid-60s until they were absorbed by Delta. Since the drive to BLI is about the same time (though more miles) as the drive to SEA, I would have used them. Now the service at PAE (walking distance from my house) is on hold due to the shutdown. So many airlines that never got beyond the website and logo stage: Air Gumbo, TheCoast, Family/Avatar, Crystal Air, Northern/Oneida Air….etc. I eagerly await more blurry “visionaries” thinking they can do it with just a name (Braniff 3, and 4, Pan Am 2, 3, 4, Eastern 2, Western 2, People Express 2, Ozark 2). Hmm, how about Meme Air? Or Selfie Air? Mesa Gateway and Gary seem to become the airports of lost dreams with California Pacific, Western, and Sky Value. So many scams out there, so many people who think the airline biz is an easy thing to do…. The trend in airline marketing these days is for nonsense, ‘fun’ names. Classy and dignified such as “National”, “Western Pacific”, “and Reno Air” went out right about with the turn of the Century. Today, it’s names like “SkyJet Pacific Click Fly.com” that are what work. What CP should have done is name themselves “Cali SunshineExpress”, since everyone (except of course actual native Californians) call California ‘Cali’. Or, SCX.com. Or just drop the ‘Sunshine’ part. Now say those three letters in quick succession and what does it sound like? In either iteration, it would’ve been a publicity coup. Have you seen “Deregulation Knockouts” by Norwood? Sounds like it is time for Round 3. Don’t forget MetJet. Flying Sun Country metal from Green Bay, WI to Fort Myers, FL, Orlando, Cancun, MX and Minneapolis. 2011 to 2013. Surprised you didn’t even mention Lion Air’s affiliates in Thailand and Malaysia, or they even expanded to full-service flying with their subsidiary Batik Air. Lion Air is actually AirAsia’s biggest rival in the LCC market in Southeast Asia, your short description here doesn’t really give them justice. The paragraph after aura has a minor typo “now ending” instead of “no ending”. Reminded me of when I flew Vision Air from SFB-SDF. The 737 classic was 80% empty and we ascended like a rocket.